Occasional Toronto: August Theme Day: "Music"
The August theme for the City Daily Photo Blog community is Music and for this one I offer this great old Wurlitzer jukebox full of 45s from the 50s & 60s. Spotted in a downtown loft - priceless! Taking part in the theme "Music". Click HERE to see more examples of music from around the world. ...and a delight to the eye! Thanks Pat... you just made me remember sweet memories from my teenage years. I LOVE this! In fact, it's exactly what I thought about posting. Trouble is, I couldn't find one. This one is just gorgeous. Always loved the old jukeboxes with all their colored lights and early rock and roll music. There were some good things about the 50s and 60s, but I don't want to go back there. August? Did you say August? Holy cow. It'll be Christmas in a minute. 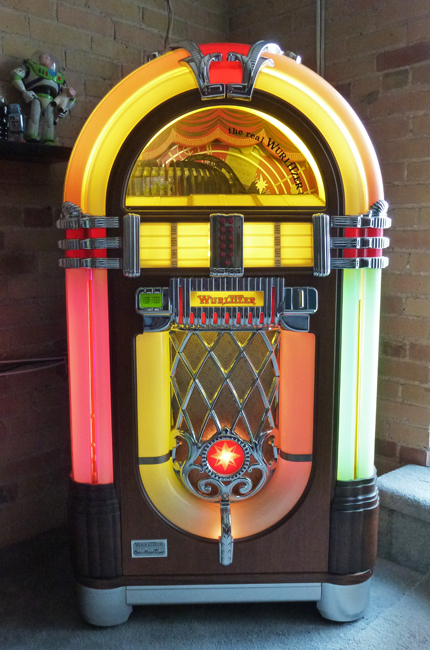 If I ever own a jukebox, I want it to look just like this one. I think that image is taking a few of us down memory lane! Wow, that is a beauty and a fantastic shot for the theme. Those Wurlitzers are such gorgeous old machines and they're very rare now. This is a real beauty and perfect for today's theme. An excellent choice for the theme. This one is gorgeous. We see them here occasionally. Oh, the old days ! Great find for this theme, Pat ! Colorful and brand new looking. Do they still make these? Oh, such a nice jukebox!